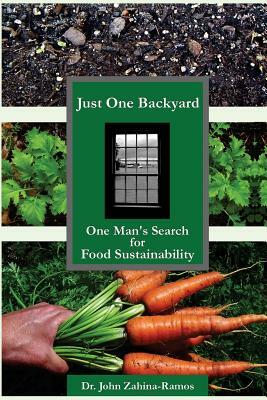 Winner of Writers Digest's 1st Place Award for Self-Published Nonfiction (e-book, 2015), Just One Backyard: One Man's Search for Food Sustainability is an entertaining and enlightening tale of how Dr. Zahina-Ramos turned his urban residential backyard into a study to measure the many benefits of urban agriculture. This is no dry lecture based on puffed-up rhetoric. Rather, it is a heartwarming blend of storytelling and scientific facts that any novice can appreciate and enjoy. The first half of the book takes the reader on a thoughtfully told journey through the history of food growing, from ancient times through the 21th century, describing how our food supply has become dominated by an industrialized production system that is dependent on unsustainable practices and harms the environment. By drawing upon historical fact, his family's experiences, and stories told to him by food gardeners around the world, its eloquent message remains fresh to the end. The second half of the book gets down to the nitty-gritty of what sustainable food growing is and the numerous benefits it can give. Several chapters describe the social, environmental, ecological and economic benefits of urban agriculture in a way that has never been possible before- with real numbers, rather than broad generalizations. Even though the current unsustainable food system is fraught with problems, Dr. Z lays out solutions that can provide for the needs of the 21st century. The result is inspirational and empowering. This timeless work is destined to become the foremost book on the benefits from and necessity of urban food growing. Dr. John Zahina-Ramos has been featured on the PBS series Victory Garden's Edible Feast and articles about his work have appeared in the Palm Beach Post, Florida Food & Farm and the National Endowment for Financial Education Newsletter. Dr. Zahina-Ramos has taught at Loyola University Chicago and Palm Beach State College on the topics of environmental sustainability, sustainable agriculture, environmental issues and environmental mapping/GIS. He is an avid backyard food grower and founded the Just One Backyard Web Resource (www.justonebackyard.com) to promote the practice of sustainable food growing, particularly in cities.